A while back I made these Slutty Brownies, inspired by What’s Gaby Cooking and they have been one of the most popular recipes on the site. And, one of our favorite things to take to ANY event in which bringing something is a requirement. They go fast. People rave about them–it feels good to have your food loved. I was thinking about the dessert table for Thanksgiving and getting some cookie platters together for Christmas and my mind wandered to these goodies. I mean, why does it always have to be about the pie and the homemade candies? I started to think about ways to modify these brownies for an even tastier treat and I think I may have found it–especially if you are peanut butter lover. 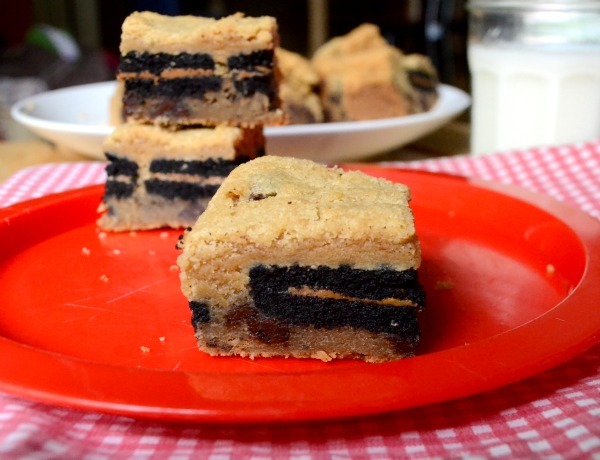 These start with a layer of chocolate chip cookie, peanut butter sandwich cookies in the middle and a layer of peanut butter blondies on the top. Um, yum! I actually tried two different versions—one using peanut butter cookies with peanut cream in them (similar to Nutter Butters, but I used an organic brand) and another using Newman O’s with the chocolate cookie with peanut butter filling. Both were great. But, the ones with the Nutter Butter like cookies were better. So much better, in fact, that I couldn’t get a photo of them. The Newman O peanut butter sandwich cookies is definitely more photogenic, though. Don’t you agree? You could even use plain ol’ Oreos in the middle and tone down the peanut butter a tad. But, if you love peanut butter–you might not want to do that. There are so many possibilities! 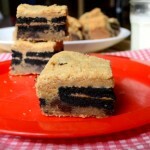 Like the slutty brownies, these are super easy to whip up. Super easy for everyone to eat too. 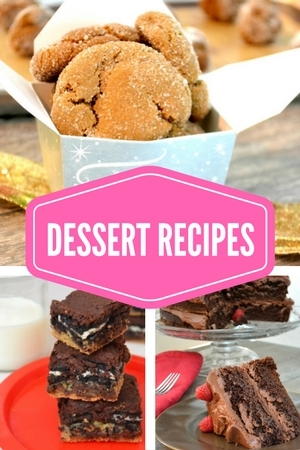 Even if you don’t put these out for Thanksgiving, keep them in your back pocket for a show stopping dessert. Preheat oven to 350 degrees. Prepare an 9×9 pan with foil, leaving sides overhanging for easy removal later. Make the chocolate chip cookie dough. Sift together the flour, salt, baking powder and baking soda. In a separate bowl, cream together the butter and sugars. Add the egg and vanilla. Add the dry ingredients to the wet and mix until combined. Add the chocolate chips. Make the brownie batter. Sift together the dry ingredients in a medium sized bowl. In a separate bowl, cream together the butter, the peanut butter and the sugars. Add egg and vanilla. Add the dry ingredients to the wet and mix until combined. Set aside. Scoop the chocolate chip cookie dough into the bottom of the pan–pressing down to ensure an even coverage. You may have a little bit left over if you want to sample it. Open the Oreos. Eat one. Eat another one. Stop eating them. 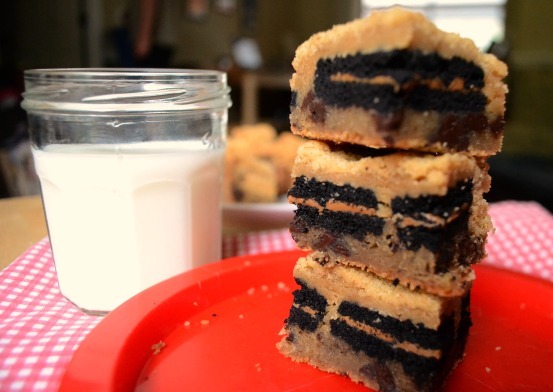 Make a nice layer of Oreos on top of the cookie dough. You don’t need to get them super close together. You don’t need to overlap them. Just a layer….don’t stress so much about the details. Pour the brownie mixture on top of the Oreo layer. My brownie was a bit thick so I poured it on in glops and used a spatula to smooth it out. It worked wonderfully. You just want a nice even brownie layer over the top of the Oreo layer over the top of the chocolate chip cookie dough layer. Bake for 35-40 minutes. Check with a toothpick to ensure it is cooked all the way through. Let cool for 20 minutes before removing the foil from the pan. Cut into little squares and watch them be devoured quickly.